Wisdom teeth grow in at the back of the mouth, behind your molars. There is a set on the bottom as well as the top. Wisdom teeth often grow in crooked, sideways, or otherwise misaligned. As they grow in, they can push on other teeth, causing problems of overcrowding and misalignment for them as well.As the wisdom teeth come in, they can be very painful. You'll feel wisdom teeth pain at the back of your mouth, behind your molars. Wisdom teeth pain can be constant for some people, while other people only experience pain and discomfort when chewing food or touching the area. If you look into a mirror, you may even notice that your wisdom teeth have begun to poke through your gums. The area might also be red, enflamed and tender to the touch. 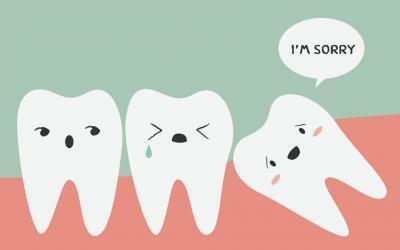 If you are experiencing wisdom tooth pain come see us at SweetWater Dentistry in Fairhope, AL! Our team of professionals will provide you with the best expertise on what you should do next for oral care! Let us contact you today for your free consult!